Fabulous 14k White gold Amethyst and Diamond earrings. Amethyst are princess cut and each measures 8mm and are a nice deep purple. 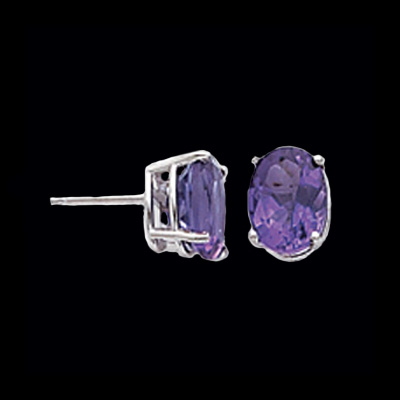 Genuine amethyst are bordered with 3/8ct diamonds to create these great earrings. 14k Yellow or White gold oval Amethyst Earrings. Rich purple amethyst set in gold create and incredible earrings. We have this earrings design in sizes from 5x3mm up to an incredible 14x10mm oval. Gemstone oval stud earrings are a great jewelry box staple or Birthday gift. Oval Amethyst Earrings set in 14K Yellow or White Gold baskets. Earring sizes start with a dainty 5x3 and are readily available up to a BOLD 14x10mm. The Gems are Beautiful, very nice earrings. 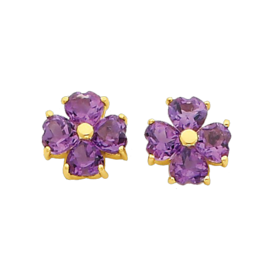 14K Yellow or White Gold Amethyst Earrings. Gold Basket settings hold Beautiful Round Amethyst Gems in a Large variety of sizes. This earring design is available in all of the birthstone gems, if you don't see one you're looking for use our special request link. Price shown is for the 5mm Round size, order these in sizes up to a dramatic bold 10mm Round. 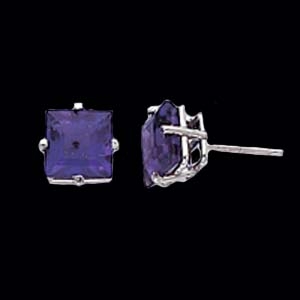 Beautiful Emerald Cut Amethyst Earrings. 14k Yellow or White Gold baskets hold these pretty emerald cut Amethyst gemstones. These amethyst earrings are available in a large variety of sizes starting with the 6x4mm 1.1 ctw selection to a Big Bold 12 x 10mm totaling 10.4 carats WOW. 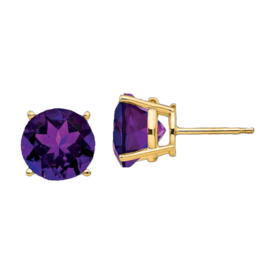 Gorgeous Amethyst Trillion Earrings set in 14K Yellow or White Gold Baskets. This lovely Trillion shape is available in 5mm, 6mm, 7mm, and 8mm sizes. We have most gemstones available in this earring design, use our request if you are looking for something special or not listed. Rich royal Purple Amethyst is the birthstone of February. 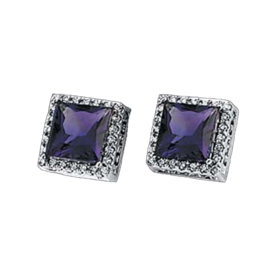 Amethyst princess cut stud earrings. Luscious purple princess cut amethyst set in 14k white or yellow gold are a great jewelry staple for those days when you just feel like a princess. 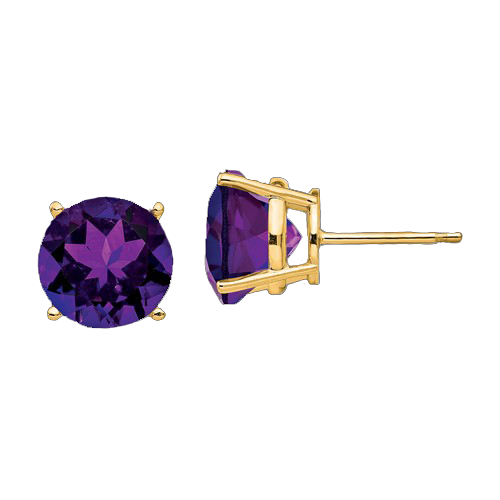 Amethyst stud earrings start at 4mm up to a large 8mm selection. Adorable heart shaped amethyst flower earrings. 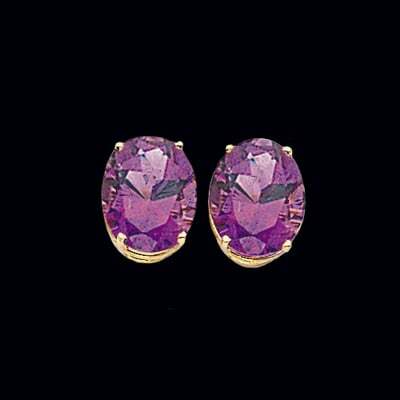 Rich purple heart shaped amethyst are set in a flower design in this adorable pair of amethyst post style earrings. 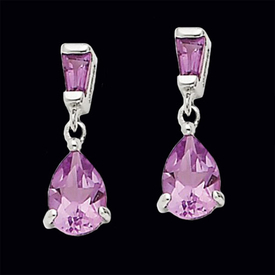 Amethyst is the birthstone for February but also a beautiful color to wear any-day. 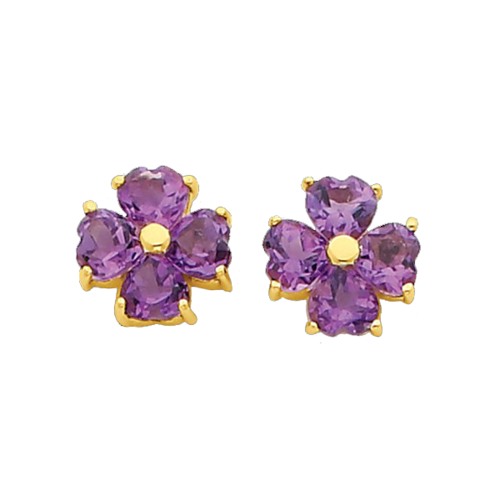 Amethyst total 1.75ct tw and are set in 14k yellow gold. This pair of earrings would make a great gift. 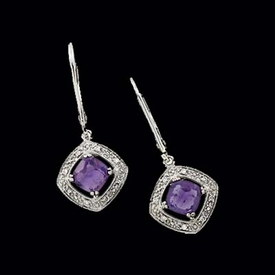 Beautiful 14k white gold amethyst and diamond dangle earrings. This great design features 2 6x6mm antique square faceted amethysts set in a white gold frame that is accented by .08ct tw diamonds. Earrings are a lever-back design, very nice earrings. Trillion shape Amethyst with white sapphire accent earrings. 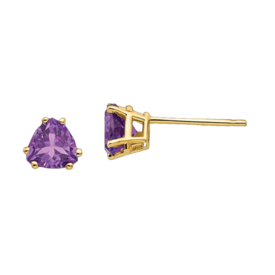 Large 8x8mm trillion shape Amethyst is set in 14k yellow gold and accented with a brilliant white sapphire to create this sophisticated amethyst studs. Amethyst is a rich purple color, beautiful earrings. This pair of earrings is custom made to order. 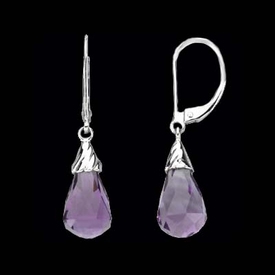 Pear Shaped Amethyst Earrings in 14K Yellow or White Gold. Rich purple amethyst create a lovely pear shape pair of earrings. Available in a large variety of sizes from a dainty 5x3mm to a Bold 10x7mm. Order yours today!!! Beautiful 14k white or yellow gold amethyst briolette earrings. These dangle earrings hold a large 12x8mm briolette amethyst, a great pair of earrings for everyday. Lovely 14k white gold Amethyst trillion earrings. 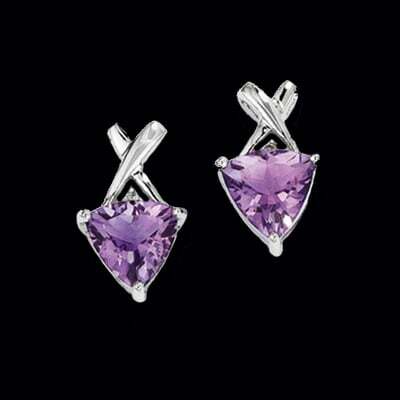 Genuine purple Amethyst are a gorgeous trillion shape faceted gem and weigh 1.72ct tw for the pair. Pretty 14k white gold "X" design sits above the gem creating these great earrings. Rich purple is a color worthy of royalty and the birthstone of February, you'll love them. 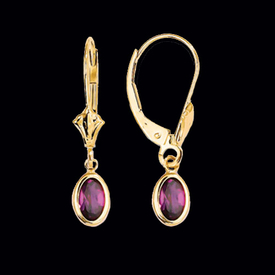 14k Gold Amethyst lever-back earrings. Rich purple Amethyst measure 7x5 but are also available in larger sizes of 8x6 and 9x7mm. Our price shown is for the 7x5mm ovals totaling approx. 1.5carats. The larger 8x6mm are 2.10carats and the large 9x7mm total an incredible 3.20 carats. The royal purple amethyst is February's birthstone and is said to be the symbol of inner strength and personal empowerment. 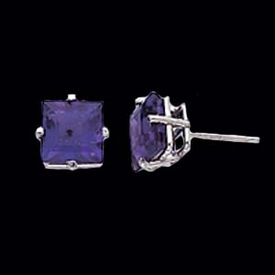 Great amethyst lever-back dangle earrings. 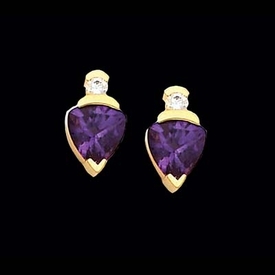 Pretty 14k white or yellow gold dangle Amethyst earrings. Pear shaped Amethyst dangle in this design, Amethyst totals 1.2ct tw. Earrings are a post style. Great everyday wear. 14k Yellow or white Gold Peridot stud earrings. Vibrant green Peridot is available in a variety of sizes starting with this 4mm selection. Special order additional sizes. Arrives in a velvet gift box. Adorable 14k White gold Butterfly and diamond earrings. Marquise vibrant peridot form the wings with a white gold diamond body. Marquise measure 5x5.2 and 6x3mm. Peridot earrings. Gorgeous 14k Yellow or White gold genuine Peridot heart shaped earrings. Our peridot is vivid brilliant lime color. This exciting earring design is available in several sizes. 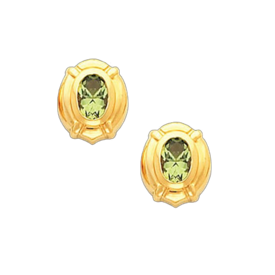 Our price shown is for the 5x5mm earring size. Shipped in a velvet box perfect for gift giving. 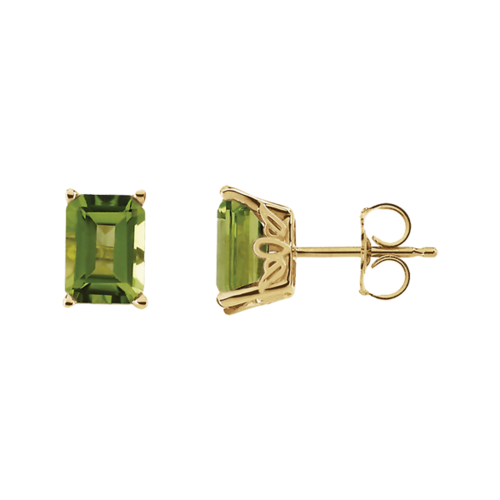 Peridot earrings in 14k Gold scroll design setting. These peridot gems each measure 7x5mm emerald cut and are AA quality. Lovely vibrant earrings.